Quick Tech Trick # 2: Where is the 'Show Desktop' icon in Windows 7? - Blogger I.Q. 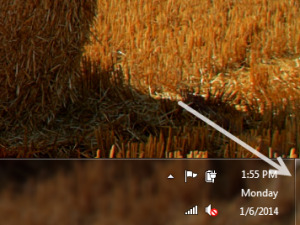 You are here: Home / Guide / Quick Tech Trick # 2: Where is the ‘Show Desktop’ icon in Windows 7? Quick Tech Trick # 2: Where is the ‘Show Desktop’ icon in Windows 7? In Windows 7, the ‘Show Desktop’ icon no longer exists. Instead, Windows chose to put it near your system tray (bottom right corner). Just move your mouse pointer to the bottom right-most corner. Bam! You just ‘showed your desktop’ to yourself.